The Dunwoody Chamber of Commerce and JustTrashIt! 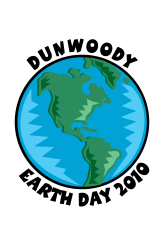 are holding the 1st Annual Dunwoody Earth Day on Saturday April 24th from 12 pm-4 pm at The Dunwoody Chamber House located at 5518 Chamblee Dunwoody Rd. As part of the City of Dunwoody's commitment to recycling, Dunwoody residents are urged to do their part by helping reduce the amount of trash that goes into the landfill and by conserving water usage. At the event, there will be on-site document shredding, electronics recycling, and toner/ink cartridge, battery and cell phone collection. Rain Barrels & Compost Machines will be for sale at a discount with a portion of the proceeds going towards the Dunwoody Chamber. It is estimated that almost 50% of all household trash is comprised of kitchen scraps and yard waste which can easily be composted into a nutrient rich additive for your garden. If 1000 Dunwoody residents actively composted their waste, it would divert 600,000 lbs or 300 tons from going into the landfill each year. Did you know that 1 inch of rain falling on a 1000 sq ft roof harvests up to 600 gallons of rainwater for use on your lawns and gardens without even turning on the tap? These numbers are significant! If we each do a little, we can save a lot! For information about the event, please visit http://www.justtrashit.com/ or http://www.dunwoodyga.org/.